Kendrick Warren started his senior season with the Rams in 1993. We all know it’s not how you start but how you finish. That certainly applies to a college hoops season. But that point aside, I think we also need to occasionally take a second to appreciate the present, appreciate the journey, step back and understand how rare certain accomplishments are. At VCU we’ve become accustomed to success. The Rams have been nationally ranked frequently over the past six seasons, have been an NCAA tournament staple and have basically just made a habit out of winning in the post-Final 4 era of black and gold basketball. But 6-1, as crazy as it may seem, is a very rare thing around here. It’s so rare in fact that the last time it happened was all the way back in 1993. 1993, one of my favorite years. Seriously. I was 13, Will Wade was 11 and no doubt we were both probably wearing ill-fitting pants with too many pockets and zippers while experimenting with early-90s bad haircuts (Wade has curly hair like myself, so we might’ve both failed on bowl cut attempts). 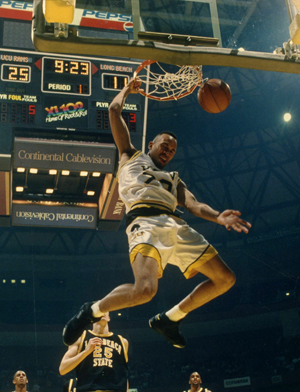 VCU’s 1993-94 season ultimately ended in disappointment, a 13-loss season that concluded with a final L to then-conference rival Virginia Tech back in the now-defunct Metro Conference (fun fact: Louisville was a conference then. How wild is that?). Kendrick Warren was our star player. He now has a jersey hanging in the rafters at the Siegel Center. The Rams six wins then were over JMU, Radford, Liberty, Buffalo, Siena and George Mason with VCU’s only loss coming to that team across town that wears the red and blue. This year’s Ws include victories over the likes of LSU and St. John’s, wins fans like myself undervalue due to those teams current (and expected) RPIs, but wins over programs from legit conferences, teams with histories that include players like Shaquille O’Neil, “Pistol” Pete Maravich and Chris Mullins (who coincidentally now coaches the St. John’s team we just beat). I think it’s important to sometimes step back and appreciate that wins over those types of programs weren’t always so expected. We’ve come a long way. But on to the important stuff, the things that made us all love 1993. It was the end of Czechoslovakia and the beginning of Monday Night Raw. Bill Clinton was inaugurated as President and during a middle school trip to DC for that, I spent every penny my parents had given me for food on a slick pair of roller blades. Janet Jackson gets bra assist in controversial ’93 Rolling Stones cover. How can shindlers list not make cut. Really? Schindler’s List not on the list? some things you just don’t admit……It is your own list and everything…but geeze….